Hello everyone! As the feasting season embarks, what can be effortless, enticing, and succulent to serve for sharing? For me, it will be some golden seared scallops, with crispy corners laid on a bed of steamy greens with flavoured wine butter. Today’s recipe is inspired by Donna Hay’s variations of flavoured butter from last year’s Christmas issue. What is flavoured butter? 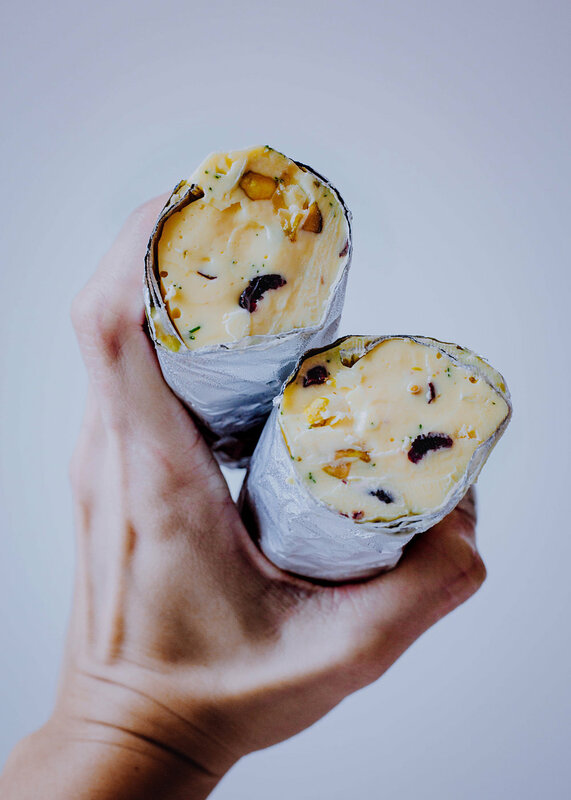 Basically, it’s an assemble of herbs, dried fruits, and nuts of your choice, mixed together with soft grass fed butter, and rolled into a huge Tootsie Roll to freeze. Then, cut a few slices and let them liquefy on your lightly seasoned roasts, blanched foods just before serving. Convenient and easy! 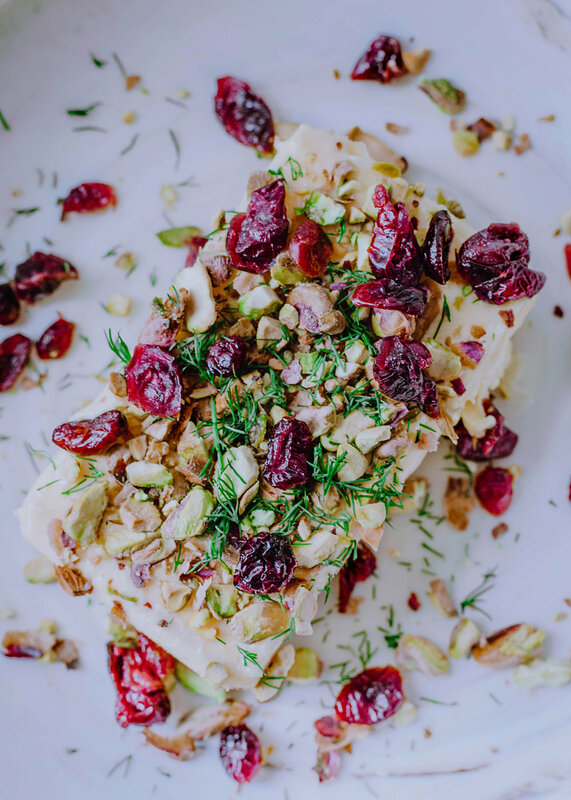 For my version, I've chopped up dried cranberries, pistachios and fresh dill for the Christmas colours, grated a substantial amount of orange zest and finished with a splash of Sauvignon Blanc from TTG wines for the bonus citrus flavour. As for scallops, gosh, they are so meaty and luxuriously tender, yet easy to overcook for the first time. Before we start cooking, there are two types of scallops, wet and dry scallops. Wet scallops aka “soaked” scallops are generally whiter in colour. They are soaked in a bath of phosphate to gain water-weight after absorption. What you purchased are “swelled” scallops. Once they are cooked, the absorbed water evaporates and they shrivel. Also, bear in mind that they take longer to caramelise and less sweet than their dry counterparts. However, if you’re a little price conscious and not too concern about the size of the scallops, wet scallops still works fine! Fyi, I am using wet scallops in this recipe simply because it is for sharing, and flavoured butter improves the taste to be naturally balanced. Dry scallops are off white, leaning towards “vanilla” shade, as they are not soaked in phosphate. In fact, they are the natural, and superior scallops that caramelises gorgeously. Of course, they are slightly on the pricey end. 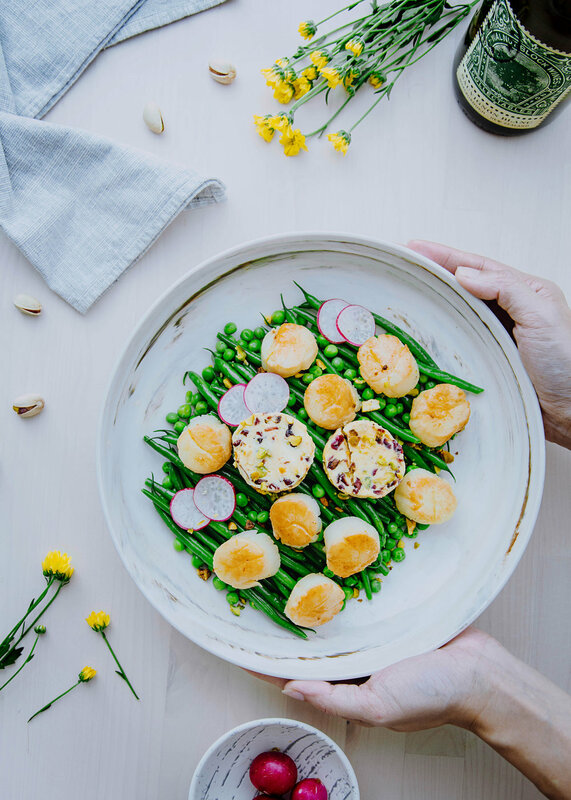 The key to treat scallops right is to pat them dry on kitchen towel, season with a pinch of salt and pepper, and use kitchen tongs to lay them swiftly on a pool of shimmering olive oil. Don’t get too excited and hasty to flip them. Leave them untouched to sear, swivel a little for even browning then gently flip them only once. Cook the other side about half the time required on the first side to preserve their tenderness. While searing the scallops, blanch french beans and peas concurrently. Just before both are ready to remove from heat, unwrap flavoured butter, chop a desired amount first and store the rest. Drain and plate the greens on a platter, and stack the crispy, browned scallops and flavoured butter alongside. You’ve got to be quick for this final step for the liquid gold moment to happen! Finally pair this delicious, buttery seafood main course with the aforementioned white wine. 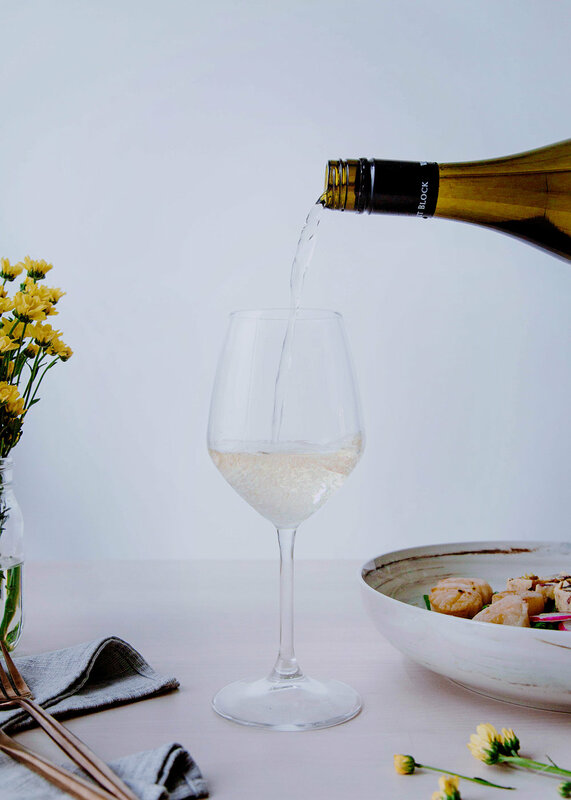 It’s herbaceous taste profile melded with exotic fruit notes is surprisingly soothing to wash down the richness in one mouthful. An absolute woman’s pleaser I must say! Before flavoured butter at least 2 hours ahead of cooking, I prefer to prepare them a night before. Once scallops are thawed, pour thawed water and use scallops immediately. Do not leave them out in room temperature. Leave your comments down below if you have any questions regarding the recipe! Leave out unsalted butter in a mixing bowl for 5 minutes till it softens. Add all flavoured butter ingredients into the bowl, and mix thoroughly till they are combined. Taste, and sprinkle more salt till desired. Lay butter mixture on the edge of the aluminium foil sheet closest to you. Gently pull away the edge of the sheet from work surface and roll over the filling. Tuck the filling tight, twist both ends to secure it. Put in the freezer at least 2 hours before slicing the amount you need every time. Divide and lay thawed scallops on two kitchen towels, take another two pieces to pat dry completely. Season lightly with salt and black pepper on both sides. Heat olive oil on a large skillet over medium high (induction hob heat 7) until it shimmers. Lay scallops, flat side down with spaces in between quickly. Avoid overcrowding, work in two batches if necessary. Without flipping, Swivel and move around scallops for even browning. in pan Cook scallops for 4 minutes until a golden brown crust forms on the bottom. Flip over and cook for another 2 minutes until flesh turns faintly solid white, and forms white strips. Transfer scallops to a plate. While pan-searing scallops, boil 1 litre water in a medium sauce pot over medium high. Blanch garden peas and French beans for 3-4 minutes till they turn bright green. Drain and plate them on a platter. Cut two slices of flavoured butter, about 1.5cm wide and lay them on the greens. Stack pan-seared scallops and radishes over greens. Sprinkle pistachios, serve and pair with a bottle of Walnut Block Sauvignon Blanc.